Designed specifically to fit the SIG 556 & SIG 522 Series Rifles & Pistols. 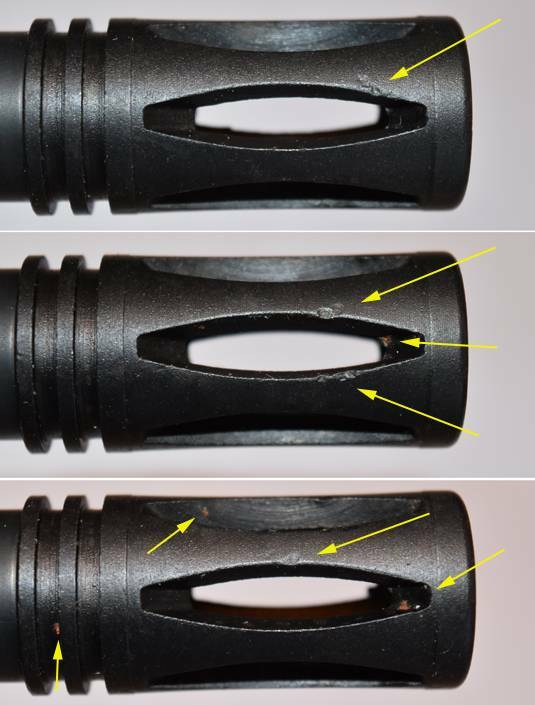 SIG USA now uses a shoulder at the bottom of the threads which will NOT allow the flash suppressor to bottom out. We can add this undercut / counter bore only if required. The undercut / counter bore area will not be plated. Sorry SIG USA made this change unknown to us (as usual). We have less than 85 of these flash suppressors available and once they are sold, all new production will have this counter bore on them, so they will fit all SIG 556 Barrels. We first discovered this on 03-26-2013, so any previous orders will be fixed at no charge to the customer. 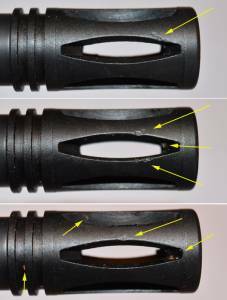 The way to tell if you need the counter bore or not is to look at the bottom area where the threads end in profile. If the diameter or this non threaded area is the same size or larger than the threads (it will be slight) then you NEED the counter bore. Counter bores are NOT required if when you look at the threads in profile (sideways) and the non threaded area is clearly a smaller diameter / lower in profile than the threads are. These got damaged at some point and the finish is below what we normally accept. Strictly cosmetic issues that can only be seen at very close range, like 3-4 inches away. Great value. Most have 1-3 hits while others have less or more. There is no hand select as I grab what is available. Some may also have tiny spots of rust. None are worse that you can see in the first photo. The rest of the description is for the 100% good ones, but parts affect the damaged ones as well so I left the below in this description. We test all our Muzzle Brakes to be 100% sure that they function shot after shot without any problems. MFI uses the term "Flash Suppressor" ONLY in reference to the shape / look that our Muzzle Brakes have as they are designed to mimic the external appearance of their Military Counterparts. This product fits any weapon with a threaded barrel in 1/2 X 28 tpi. SIG USA does NOT supply any of their rifles with Flash Suppressors that look like the Original SIG 550 / 551 / SIG SAN / SWISS SIG. Even if you could find an original flash suppressor it would be impossible to mount to the SIG USA rifle or pistol without major modification. 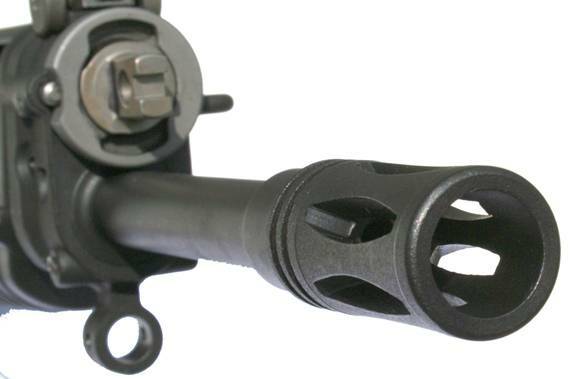 This Flash Suppressor / Muzzle Break WILL allow the use of a standard US / NATO style bayonet (M7, M9 or M11). This flash suppressor has an added 6th cut / slot (originals had 5 slots with lower section being filled to deflect flash). This way you do not need a peel washer to index the FS to the correct location. The peel washers always created a problem in terms of looking incorrect as well in that the original SIG 550/1 flash suppressors were machined in the barrel and thus not removable. The Flash Signature of the MFI 550/1 & 552 Flash Suppressors / Muzzle Brakes are comparable with original. NOTE: SIG 556 Rifles & 556 Pistols have the SAME THREAD PATTERN as .223 caliber AR15s / M16s which is 1/2 X 28. This is the same thread pattern we use for this product. NOTE: As these have uniform flash cuts / venting slots 360 degrees around there is no need for a peel / crush washer. Heat Treated to about Rockwell 34. Threaded 1/2 X 28 tpi. This will fit any AR15 in .223 as well. Weapons Grade Steel / Mil. Spec. Black Oxide to be a close match to USA SIG barrels. WILL allow the use of a standard US / NATO style bayonet (M7, M9 or M11). Super cheap and you cannot see the issues without being within 8" or closer. Super fast and cheap shipping too!